There is actually plenty of things to do in Bryce Canyon, but by far the most popular is taking in the scenery. The park is best known for it's Hoodoos (also called a tent rock, fairy chimney, and earth pyramid). Hoodoos are tall, thin spire of rock that rise from the ground and are a result of millions of years of erosion. Hoodoos can range from 5-150 feet tall (1.5-45 meters). Due to the transition of the sun across the sky and it's changing position the park almost comes alive. It will look different due to lighting and shadows depending on what time of day you are viewing the park. There are 14 different scenic view points from within the park. Most people will drive the park taking advantage of the different areas to take in this breathtaking landscape. Some people will choose to ride the shuttle buses so they don't have to find parking spaces. The shuttle is free of charge with your park admission. You can hop on and off at the various view points. There are a multitude of hiking trails (nearly 50 miles of day hiking trails in fact). These hikes range anywhere from 30 minutes with a low level of difficulty all the way to half day hikes which can be a bit more strenuous to hike. Fore more Information Click Here. What better way to view the splendor of Bryce Canyon National Monument then riding in the saddle? Ready to ride? 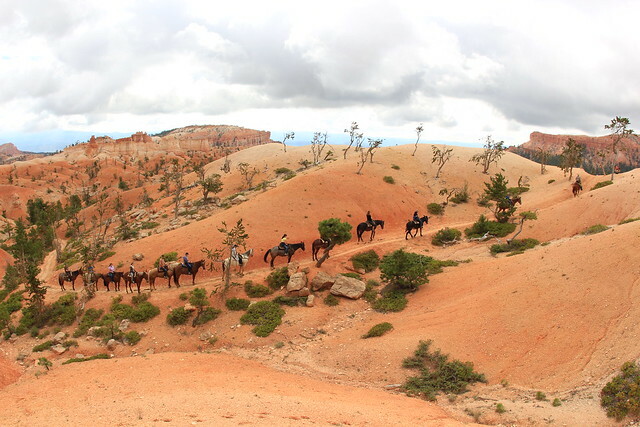 Click to learn more about Horseback riding in Bryce Canyon! There are two campgrounds in the park with running water and flush toilets. There are not any electrical, water or sewer hook ups at the camp sites. The cost is $15 per site per night. The campgrounds usually has availability right up until dark. It's a great way to enjoy the parks natural setting and the night sky which Bryce Canyon is so famous for. For those who wish for a little more comfort then a sleeping bag and a tent, Bryce Canyon does have an historic lodge about a mile south of the visitor center which was constructed in the mid 1920's. The lodge is open April 1st - November 1st. It is kind of a "rustic experience". There are no televisions in the lodge or in the rooms. People come from all over the world to stay in the lodge at Bryce Canyon. There is also a General Store in Bryce Canyon National Park which is open April 1st to November 1st as well. The park is open everyday of the year and the visitor center is only closed on Thanksgiving day and Christmas day.